In the late 1970s, the National Weather Service implemented the Integrated Flood Observing and Warning System (IFLOWS) throughout the Appalachian Region of eastern America. 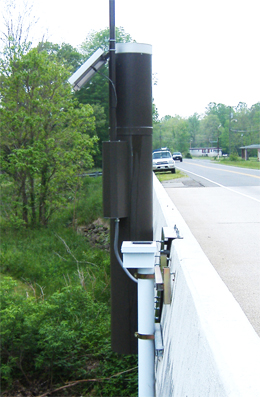 As an IFLOWS cooperator, the Virginia Department of Emergency Management (VDEM) has since developed an extensive network of gauging stations for the system using the ALERT communication protocol. After three decades of use, VDEM's network consisted of nearly 300 aging, nonprogrammable ALERT transmitters. By that time, there had been many advances in monitoring technologies. The ALERT protocol used in their network is a one-way communication protocol and newer protocols with increased capabilities were available. Additionally, new FCC regulations conflicted with the communication methods being used. Because of the need to upgrade the overall state of the network, VDEM began evaluating new generations of datalogging and transmitting equipment for early flood detection and warning. To date, VDEM has purchased approximately 90 of these packaged transmitters. Priority for receiving the new equipment has been on remote stations measuring water-surface elevation.